Show various clear plastic objects between crossed polarizers on the overhead projector. 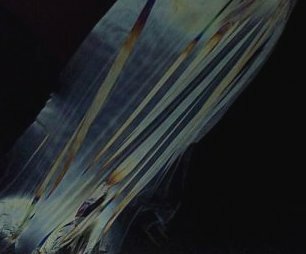 When flexed the plastic becomes anisotropic and therefore birefringent and bands of color can be seen. 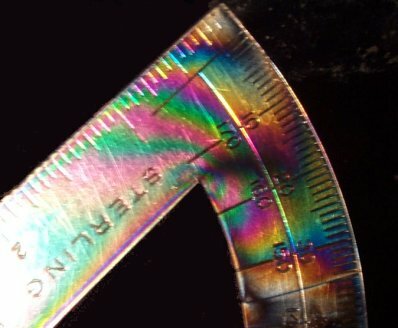 The protractor shows colored bands without being deformed because anisotropies arise when the plastic solidifies when manufactured. The colored patterns reveal internal stresses. 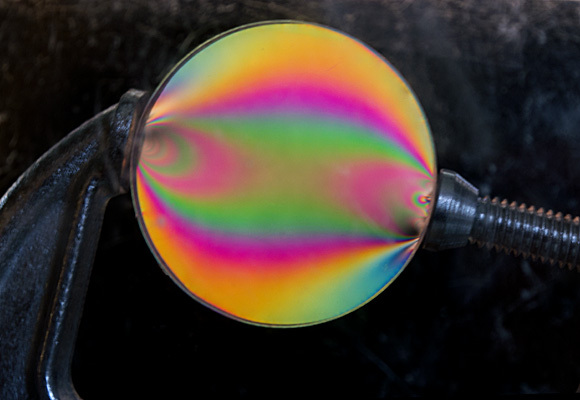 Place saran wrap between crossed polarizers and stretch along a direction 45° to the polarization axes to show that it becomes birefringent and allows a component of the light to pass. We have a commercial device (202-21-E6) to do the squeezing and stretching of the items in the polaroid specimens kit.